This remarkable place is a must when visiting Paris. 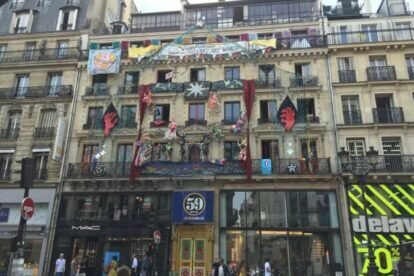 It started out as a squat in one of the most expensive commercial streets of Paris and later on transformed into an alternative art place. The entire house hosts different artists and their shows change as they live. So basically you come in and walk around the rooms looking at the different art showcased in each of them. Some of them also sell their work there. You can attend seminars, music concerts or other types of performances. What is amazing is the building itself, where the walls have been decorated by all artists passing by, including the staircase, and the very steps you walk up! I like to go there to see what is new, look at some artists working on a new painting or sculpture, enjoy the huge atmosphere of creativity, or simply let my mind escape for a few minutes in this magical space. When you get out into the busy Rivoli street, full of all the classical brands you can find in every town and with people everywhere, one wonders what we are all after and what is real and what surreal.